Product prices and availability are accurate as of 2019-04-19 17:16:14 UTC and are subject to change. Any price and availability information displayed on http://www.amazon.com/ at the time of purchase will apply to the purchase of this product. 100% Brand New, High Quality You will receive a latch kit. The strike is made out of metal. 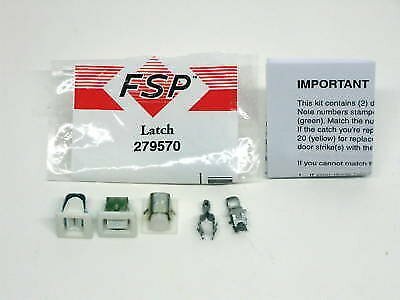 This strike will replaces plastic strikes.This item is a replacement for Maytag numbers's LA1003, LA-1003 and 306436 & Frigidaire numbers 5366021400, AP3094183, PS334230 and PS2162263.These fit most manufactured dryers. The kit includes 3 Female Latches (to fit the body) and 2 Strikes (to fit the door).The Latch is Plastic with a metal Spring clip around it. Some newer models have 2 latches on a door These latches are color coded and instructions to know which color to use are included.